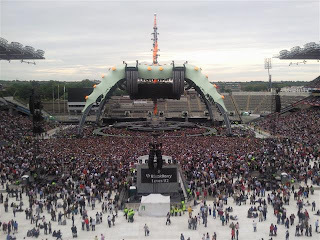 I wouldn't have paid €130 to see U2 in Croke Park - frankly, nothing is worth that kind of money, but seats in the Davin stand for €33.60 was too good to refuse - especially as we didn't have to queue to buy them ourselves. It turns out our seats were slap bang in the middle towards the front of the Upper Tier, giving us a superb view of the stage and stadium, albeit at a distance. 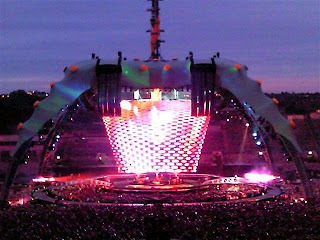 As the evening darkened, the fantastic "crab" stage and video screen became the star of the show. The colours changed throughout the night, and the screen moved up and down without us even noticing. Overall, it was a good concert, but not terribly enjoyable. 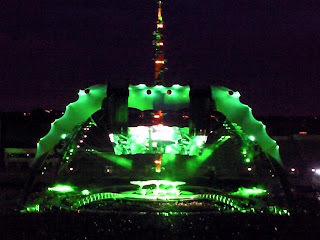 Bono seems to build the crowd up, and then flattens it. The encore was a real let-down with no enjoyable tunes ringing in our ears as we went home.